Anthony G. Picciano is Professor and Executive Officer of the PhD Program in Urban Education at the City University of New York Graduate Center and Professor of Education Leadership at Hunter College, USA. 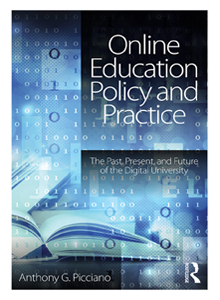 Online Education Policy and Practice examines the past, present, and future of networked learning environments and the changing role of faculty within them. As digital technologies in higher education increasingly enable blended classrooms, collaborative assignments, and wider student access, an understanding of the creation and ongoing developments of these platforms is needed more than ever. By investigating the history of online education, the rise and critique of MOOCs, the mainstreaming of social media, mobile devices, gaming in instruction, and more, this expansive book outlines a variety of potential scenarios likely to become realities in higher education over the next decade. Chapter 3 – Are the Faculty the University?